Skindinävia was founded in 2005 with the sole purpose of creating products that would keep makeup looking fresh for longer. Designed to give you perfect makeup for up to 16 hours, Skindinävia mists are virtually weightless and look completely natural on the skin. Skindinävia’s uses their very own Temperature Control Technology. The normal temperature of the skin causes moisture to evaporate quickly, drying out skin and makeup. The result of this rapid moisture loss is more makeup colour loss, requiring frequent touch-ups, excessive oil production to counteract dryness, as well as dry makeup that can crack or oily shine. Skindinävia’s patented technology forms a lightweight, breathable web that works with your makeup and slowly released over 16 hours. The timed-release evaporation retains more moisture and draws heat away from the skin. 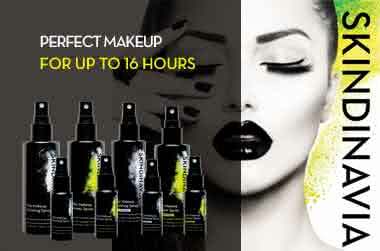 The result is fresh, cool makeup for up to 16 hours. All Skindinävia products are breathable and lightweight, and won’t clog pores. They are also hypoallergenic, oil-free and paraben-free, making them suitable for all skin types. Which Skindinävia spray is right for me? The spray that started it all. This ultra-fine mist locks makeup in place keeping it fresh and flawless. The weightless formula makes it suitable for both frigid temperatures and the sweltering summer months. Ideal for all skin types. This formula has all the benefits of the original spray with added oil-absorbing properties. Formerly known as No More Shine Makeup Finish, this spray will prevent makeup from sliding or caking. Ideal for normal to oily skin types. Kiss-proof, cry-proof and sweat-proof, this mist will keep makeup on through anything. Specially designed to resist the effects of excess moisture on your makeup, this spray will keep you looking camera-ready for up to 16 hours. Ideal for all skin types. This revolutionary spray creates a smooth canvas for makeup without any silicones. This vitamin-based formula will also assist in reducing redness and diminishing the appearance of fine lines. Ideal for all skin types. An anti-shine, vitamin-based primer mist that absorbs excess oil while creating a smooth canvas for makeup. The silicone-free formula evens out skin tone, prevents breakouts and reduces the appearance of large pores. Ideal for normal to oily skin. A favourite of makeup artists to keep skin clear in between and after makeup applications. A highly effective formula infused with key nutrients including zinc, which helps prevent breakouts and opens clogged pores. Adore Beauty is an official stockist of Skindinävia, with reviews, free shipping, samples and Afterpay available. Holy Grail of finishing spray!! I love this bridal setting spray- it&apos;s my favourite go to for not only clients but myself. I&apos;ve used Urban Decay All Nighter before and i feel theres are pretty similar if not better! Love. I bought this to try out because of all the positive reviews and I have to say, it&apos;s hands down the best setting spray I&apos;ve used so far. It held my makeup in place during heat waves and it stayed all day, I have combination skin and tend to sweat alot when hot and surprisingly it&apos;s the only setting spray I&apos;ve found that made my makeup last from morning to night. Highly recommended.